RAW Pre-Rolled Tips is exactly 21 unbleached and expertly rolled filter tips in an easy slide open box. Natural, unprocessed paper as you would expect from RAW Rolling Papers that drops into the end of any roll up to keep the herbal matter out of your mouth and provide a solid crutch for great shape and unobstructed airflow. When you don't have the time to roll up your own filter this is the way to go. Use these joint filters and put a stop to tearing the tops of cigarette boxes or using plastic coated paper. That unfortunate practice not only affects the taste but isn't too good for you either. 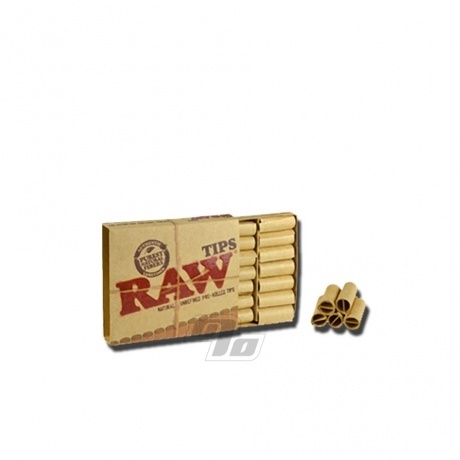 No chemical bleaching or chlorine is used in these RAW tips. Tips prevent soggy, sloppy, clogging cigarette ends. Tips conserve your herbs, no more wasted ends! Tips strengthen and give your joint a better shape and feel. Tips prevent herbs from getting in your mouth! As with all RAW Papers carried by 1 Percent, this is real deal RAWthentic. No fakes here! These tips are so convenient and easy to carry. Highly recommend. I love these pre roll tips. I hate rolling a filter and can never get them round enough. These pre roll tips are great and save time. The only thing I would change is make them a tiny bit bigger. It would be nice if they had more sizes for sale. Over all great purchase. Will buy again. does the job just fine. I had been making my own tips for years, but discovered these when purchasing papers last year on this site. I have been using them for a year now, and no longer make my own tips. These are so convenient, and do the job fantastically.